as it would be to completely renovate your kitchen, finding the spare cash to do so is easier said than done. That doesn’t mean that you have to resign yourself to preparing food in less-than-stylish surroundings. A few easy, affordable updates can dramatically enhance the appearance of this popular gathering place. Many of them can be completed in just an hour or two. Sometimes, whipping a kitchen into shape is as simple as making it more organized. Take a good, hard look at your kitchen. Does every item have a proper place, or is the room decidedly cluttered? When you open drawers, cupboards and cabinets, are you greeted with tidiness or complete disarray? Your kitchen will be a more pleasant place if it’s organized properly. 1. Replace your existing shelves with slide-out shelves. They make it a lot easier for everyone to find what they need. 2. Invest in drawer organizers and cabinet racks. They are generally quite affordable, and they allow you to create a home for every item in your kitchen. 3. Get creative with towel racks. Mount them beneath your upper cabinets. Using S-hooks, hang pots, pans and large utensils from them. You’ll free up space, and you’ll have everything you need readily at hand. There are many different ways to reface the cabinets in your kitchen. Peel-and-stick veneers are available in many different styles. Another option is to replace the existing doors and hardware, which is a lot cheaper than replacing the cabinets themselves. If you’re looking for a fun project, you could sand down your cabinet and drawer fronts and repaint them. You should also consider replacing a few solid cabinet doors with glass doors; they really open up a kitchen and breathe in more sophistication. How long has it been since you updated the lighting in your kitchen? By mixing things up a little, you can put your kitchen in a whole new light. Consider using rope lights above or below your cabinets. You can even use them in both places. They cast light above and below the cabinets, which brightens things up a lot. You don’t have to spend a fortune to get stylish new light fixtures either, so start looking. Sometimes, all that’s needed to upgrade a kitchen is a new focal point. The sink has a huge impact on the appearance of a kitchen, and it also serves many important functions. If your current sink is worn out and sad-looking, splurge on a fancy new one. If possible, get a sink that has two basins. Pull-out nozzles are nice too, so get a model that has one too. While you’re at it, you might want to invest in a new garbage disposal. They are surprisingly cheap, and they make it a lot easier to get things done in the kitchen. How’s the backsplash in your kitchen doing? 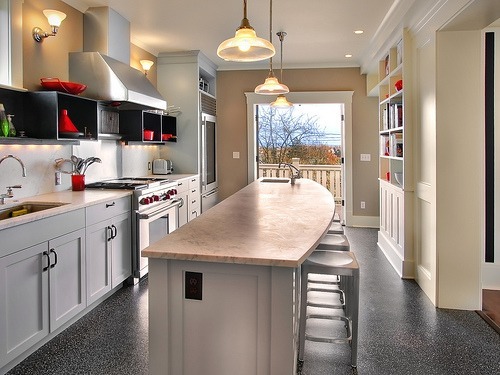 Does it enhance the appearance of your kitchen, or is it just kind of there? Replacing the backsplash is cheaper and easier than you probably think. As with cabinet refacing, there are peel-and-stick designs that you can use to instantly transform the appearance and texture of your backsplash. If you have a little more money, you can go ahead and have a more elaborate backsplash installed. You’ll love the way it improves the appearance of your kitchen. If you’re really short on cash but desperately want to enhance the ambiance of your kitchen, adding a new rug or buying a new set of kitchen towels and oven mitts can go a really long way. Add a potted plant or two, if possible. It may not seem like a major upgrade, but it can rejuvenate your kitchen and make it feel a lot fresher and more pleasant. At the end of the day, upgrading your kitchen is all about making it happen. Don’t let limited funds deter you.